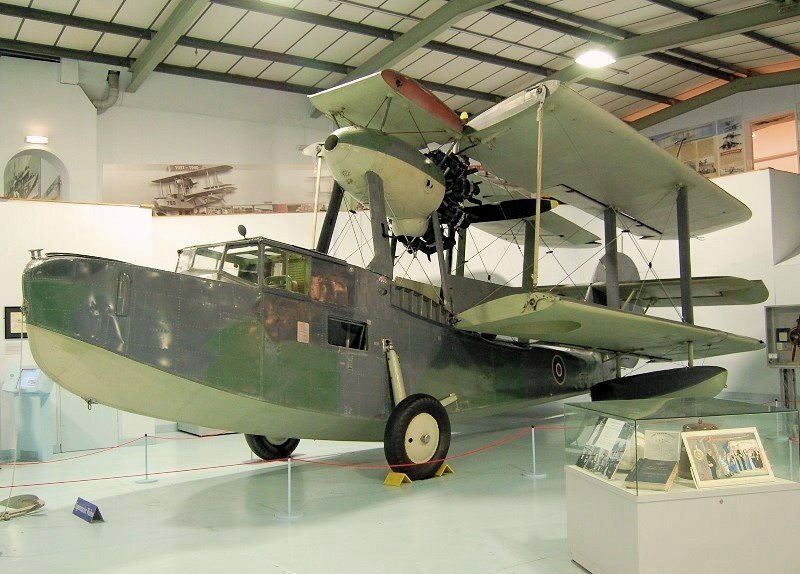 The Vickers Supermarine Walrus – an ugly duckling, but a stout performer! | Shortfinals - aviation and more! Morris Dancing – its spreading everywhere! What has this ungainly, jury-strutted, pusher biplane amphibian have to do with that doyen of WW2 fighter aircraft, the Spitfire? Well, its not just that they were both built by the same company, Vickers Supermarine Ltd, nor that both their prototypes were taken on their first flights by the renowned test pilot, ‘Mutt’ Summers – no, it is the fact that they were BOTH designed, amazingly, by that aeronautical genius, Reginald Mitchell ! In the late 1920s, Supermarine were noted for their seaplanes, and the Royal Australian Air Force took delivery of six of their Seagull III amphibians, which formed the total aircraft establishment of HMAS Albatross, a seaplane tender and the first Australian warship (1929), which would later be taken into Royal Navy, converted as a Landing Ship (Engineering), and provide engineering support and repair facilities to naval craft off Sword and Juno Beaches in Normandy, on D-Day. The RAN, at this time, just like the Royal Navy, did not operate the aircraft carried by their ships. In the RN case, the Royal Air Force supplied aircrew and engineers, and the Royal Australian Air Force did the same for the RAN. A successor aircraft to the Seagull III, designated by Vickers Supermarine as their Type 223, and capable of being catapult-launched, was designed by Reginald Mitchell in 1932, after a long series of hydrodynamic tests on models in Vickers water tank in St Albans. After being sent the specifications of the Seagull V, the Australians decided that was just what they needed and placed an order for 24. The Seagull V had a conventional, light alloy, single-step hull; the biplane wings had two stainless steel spars – front and rear – with corrugated webs and tubular flanges; secondary components were a mixture of ply and spruce. The wing leading edges were sheathed in plywood, and the whole covered in Irish linen; a stabilizing float was fitted under each wing, directly under the interplane struts. The engine (a Bristol Pegasus IIM2 in the Seagull V) was mounted at the rear of a light alloy ‘egg’, and drove a wooden, pusher propeller; there was provision for light bombs or depth charges, with a .303″ Vickers Gas-Operated machinegun in both a bow and midships gun position. The VGO’s were usually mounted on a Scarff gunring, the classic mounting from WW1. The prototype’s first flight took place on 21st June, 1933 in the capable hands of ‘Mutt’ Summers, who was later to handle all the early testing of the Spitfire! ‘Mutt’ undertook both the test flights from Eastligh Airport (Southampton) and the water take-offs and landings from Southampton Water. He was pleased with the excellent flying characteristics of the amphibian, but the thrust from the Pegasus engine’s four-bladed wooden pusher propeller impinged only on one side of the fin, meaning that a constant state of ‘yaw’ existed; this was rectified by the engine nacelle being offset to port by 3°. The other faults which had showed up – a too rigid undercarriage, and ground handling which was described as ‘only fair’, were rectified by R.J. Mitchell, and the aircraft was booked to appear at the Society of British Aerospace Companies 1933 Show, to be held at RAF Hendon. During his public display, ‘Mutt’ Summers (who had carefully checked with the company’s engineers), utterly astonished the crowd – and Mitchell, who was watching – by LOOPING the ungainly amphibian! Following catapult trials at RAE Farnborough, the Royal Air Force ordered the aircraft for use by the Royal Navy as their new spotter/reconnaissance aircraft, to be catapulted off their capital ships, and also used from land bases. The official British name was now ‘Walrus’, and no less than 746 aircraft were to be built between 1933 and 1944. The Walrus became the first British military aircraft with a fully retracting undercarriage (into recesses in the lower wing) and a fully enclosed crew cabin. Vickers Supermarine now had a major problem – space! By the late 1930s, with massive orders from the RAF for their iconic Spitfire fighter rolling in, the company now had no room for the Walrus production line. The nearby firm of Saunders-Roe (on the Isle of Wight), famous for their flying boats, took over all Walrus production. Indeed, Saunders-Roe were responsible for building all Walrus Mk II aircraft, with their wooden hulls; pilots preferred these, not just for the more powerful Pegasus VI (775 hp) but for their much ‘quieter’ take-offs and landings and its better water handling qualities. Before WW2 broke out there was just time to fulfil an order from Ireland for three Walrus to act as fishery and naval patrol aircraft, these were diverted to from RAF stocks (‘L2301, L2302, L2030’) – off which, more later! When WW2 broke out the Royal Navy took the Walrus to sea in their capital ships, and these Catapult Flights performed wonders, duelling with German Messerschmidts off the Norwegian coast, bombing land targets of the Italian forces during the East African campaign, running supplies by night into besieged Tobruk, and evacuating casualties in the Western Desert. In one amazing incident, a Walrus crew accepted the surrender of Vichy French Forces – and the island of Madagascar – by the waving of white flags from the ground! By now, the RAF was operating the Walrus, too, and it did sterling work in the North Sea, the Channel, and the Western Approaches. Its maximum speed of only 135 mph was hardly impressive, but its extreme manoeverability often allowed it to survive against enemy fighter opposition (when encounted). By 1944, however, this lack of speed meant that it could no longer act as an effective gunnery spotter for the RN’s battleships and heavy cruisers, and it was withdrawn. This allowed the RAF to take over some of these aircraft and increase its Air Sea Rescue Force, particularly in support of the 8th and 9th Air Forces of the USAF in their bombing campaign, as well as the RAF’s Fighter and Bomber Command. ASR Walrus aircraft stood ready to be scrambled from coastal RAF stations, like Manston in Kent, to retrieved aircrew who had ended up ‘in the drink’. Indeed, ASR support was not limited to RAF aircrew, as other airmen – including those from the USAAF 8th Air Force, for example – also were saved by the ungainly ‘Shagbat’, as it was sometimes known. Sometimes, extreme courage was shown by Walrus crews when they landed in minefields to pick up shot-down airmen, or taxiied many miles in seas too rough to take off, in order to bring rescued personnel back to Allied territory. The Walrus had been supplied to Australia, New Zealand, Canada, Turkey, Portugal, France and Argentina, but the end of the War brought a swift end to British service, the last examples being retired in 1946. The aircraft you can see above, ‘L2301’, in the Fleet Air Arm Museum, Yeovilton, was one of the three supplied to the Irish Air Corps; it was an unlucky aircraft, in that it forced landed off Wexford on the 3rd March, 1939, on its delivery flight. Towed to land, it suffered further damage, and was finally delivered to its destination, Baldonnel Airfield, Dublin, by road! During the early part of World War Two – or ‘the Emergency’, as it was official known in Eire – ‘N18’ served with No. 1 Squadron, Irish Air Corps. Along with the other Walrus aircraft, it performed fishery and neutrality patrols over Irish territorial waters. It might have continued its peaceful way, if it had not been for the actions of four Irish citizens (one of them was a rather discontented member of the Irish Air Corps). What happened next was the stuff of movies, if not of legend. On the 9th January, 1942, the aircraft was stolen, and the four adventurers set out in the direction of Cherbourg, in Occupied France. Their intention? To join the Luftwaffe! Needless to say, another product of R.G. Mitchell’s fertile brain, in the shape of a four RAF Spitfires, intercepted the fleeing Walrus, and forced it to land at the RAF Station at St Eval in Cornwall. The four individuals AND the Walrus were, after negotiations, returned to Ireland. Eventually, in 1946, this Walrus came up for sale, and it was purchased by the RAF ace Wing Commander Rod Kellet, DSO, DFC, RAF who was by then Commanding Officer of No.615 (County of Surrey) Squadron, Royal Auxiliary Air Force for the very reasonable sum of £150. This distinguished unit was based at the famous Biggin Hill airfield, and was flying Spitfire Mk XIVs – it was rather appropriate, therefore, that their new squadron ‘hack’ (used for swimming parties along the South Coast, under the British Registration, G-AIZG) was another Mitchell design. The aircraft was scrapped in 1948, and consigned to a dump near Thame. Here, amazingly, the fuselage and engine were found in reasonable shape by members of the Historic Aircraft Preservation Society in 1963. This time, a purchase price of only £5 was needed! The HAPS presented the aircraft to the Fleet Air Arm Museum, and a long, painstaking rebuild/reconstruction took place, until the Walrus is as you see it now, beautifully displayed, with the wings folded to show how it would have been stowed in a shipboard hangar. The Vickers Supermarine Type 236 Walrus – possibly an ugly duckling, but certainly a stout-hearted performer. G’day, Ross, and thank you for that lovely review of the Walrus’ history. There is something very charming about the airplane, seeming as it does to stand astride the divide betwixt the old days of dope and linen and the modern era of engineered materials and scientifically-derived designs. And I’m sure that the Walrus crews’ money was no good in pubs frequented by 8th AAF bomber crews! I wonder (and suspect I know the answer), are there any airworthy Walri extant? Dear Frank, Good to hear from you! I am delighted to tell you that there is ONE Walrus currently under restoration to flight; it is registered as G-RNLI (presumably standing for Royal National Lifeboat Institute), and is in the capable hands of Vintage Fabrics Ltd at Audley End. This firm is extremely capable, and I have every confidence that we will, eventually, see a Walrus in the air – a staggering prospect, I am sure. Excellent, Ross! 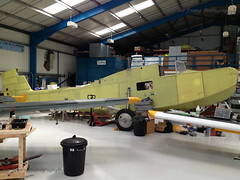 From your photo it looks like G-RNLI is progressing nicely. I shall look forward to the day when it again takes to its natural elements – the air and the sea. My friend J.A. (Tony) Shipperlee, Lieutenant RNVR, flew HMS Sheffield’s Walrus aircraft while on Arctic Convoys and has just receved his well-earned Arctic Star. He’s a fine painter and has produced an excellent picture of his Walrus flying in support of Sheffield. Please e-mail me if you would like a copy and I’ll send it to you as a JPEG. I believe the Walrus was one of the few aeroplanes at that time which could perform an outside loop; otherwise known as a ‘bunt’. If so, amazing; bloody amazing! She was apparently also known to her crews as the ‘Shagbat’. There is a gentle intonation of derogatory affection held for her therein.